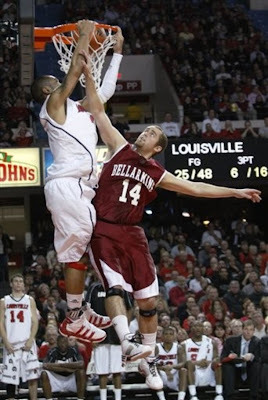 Louisville freshman Peyton Siva with the reverse putback poster dunk, via breckcard. Oooh, such a big man dunking on a reserve who is maybe 5'8" and known for deadly three-point shooting, not jumping. Hey Siva, you didn't, and can't, bring that on Bellarmine's Dapo, Patterson, or Dowe. In fact, Patterson had a drive and dunk that was just as sweet, but the stupid Louisville media is so pro-U of L they too quickly forget. Go Knights!